No, unlike what people think, Morpheus is not the god of sleep. Are you surprised? 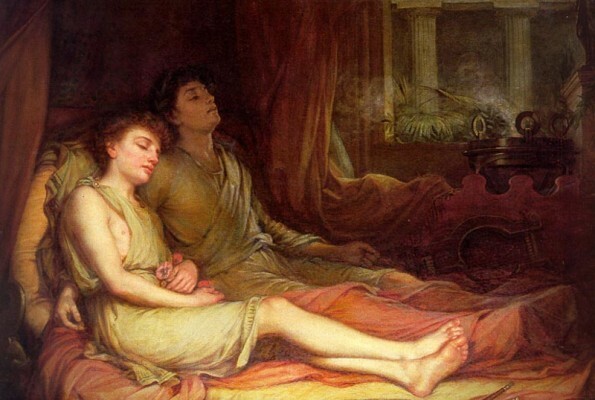 Morpheus, with Momus, Ikelus, Phobetor and Phantasos, is one of the children of the Greek good of sleep, Hypnos (Ὕπνος). Morpheus and his brothers are the “Oneiroi” and regulate the dreams of the mortals. Morpheus is the most important brother and is considered the “shaper of dreams”: the one who makes the dreams take shape. On the other hand, Hypnos, who – in the iconography – is a naked young man with a winged head, was so powerful that he could put to sleep the gods themselves. Also Hermes, the messenger of the gods, has magic powers on the sleep, as Endymion has the ability of sleeping forever. For the Ancient Romans, the god of sleep and dreams was called Somnus. In the Celtic mythology, the Goddess of sleep is Caer Ibormeith. The legend says that – once that she had fallen in love – her singing made the whole Ireland sleep for 3 days and 3 nights. The Scandinavians, whose cosmogony is dominated by Wotan, have no god of sleep. Yet, sleeping is at the center of suggestive narrations such as the one of Brunhilde, daughter of Wotan, who is awakened by Siegfried from the magic sleep into which her father had induced her. Another story is the one where Bodhvild “warmongering woman warrior” is seduced by Volund in her sleep. In India, the “Lord of sleep” is Shiva, whose name derives from “Shin”, which actually means sleep. Sleep, in general, is found in several mythologies, such as the one told in the Babylonian poem of creation, where Apsû, the progenitor of the gods and sovereign of deep water, is made fall into deep sleep by Ea, who takes possession of the abysses. A curiosity: “Nanna” was the Sumerian name of the god of the Moon.